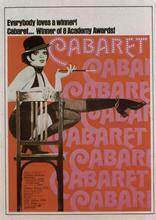 Michael York is Brian Roberts, an English writer in decadent Weimar-era Berlin hoping to teach English to Germans; he is among several romancing an American dancer at the Kit-Kat Klub, Sally Bowles played by Liza Minnelli. Won 8 Oscars including Best Actor, Best Actress, Best Director, Best Cinematography and Best Score; received nominations for Best Picture and Best Screenplay. Isherwood's autobiographical novel was adapted earlier by Henry Cornelius as I Am a Camera (1955).